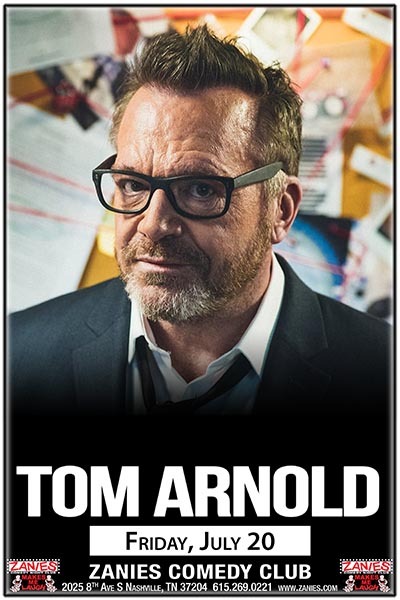 As a writer, producer, and actor, Tom Arnold has established himself to both television and film audiences worldwide, having won such awards as the Peabody Award and a Golden Globe Award. Additionally, he helped put Fox Sports Network on the map with his hosting duties on “BEST DAMN SPORTS SHOW PERIOD” and CMT’s top-rated “MY BIG REDNECK” franchise including and “MY BIG REDNECK FAMILY” which premiered at the highest ratings in CMT history. Arnold cornered the market on playing the resident comic relief in films like “NINE MONTHS” with Hugh Grant, Julianne Moore, and Robin Williams, “TRUE LIES” with Arnold Schwarzenegger, “HERO” with Dustin Hoffman, and “AUSTIN POWERS: INTERNATIONAL MAN OF MYSTERY” with Mike Myers. Arnold was seen in Stephen Gyllenhaal’s quirky political comedy “GRASSROOTS”, Tyler Perry’s “MADEA’S WITNESS PROTECTION”, “HIT AND RUN” with Dax Shepard, Kristen Bell and Bradley Cooper, ANY DAY starring alongside Sean Bean, Eva Longoria and Kate Walsh and Yahoo Comedy Series SIN CITY SAINTS starring alongside Andrew Santino and Malin Akerman, where he plays Kevin Freeman, a private casino host who happens to know all the city’s secrets. He can also be seen in documentaries, SUPERMENSCH: THE LEGEND OF SHEP GORDON and I AM CHRIS FARLEY and in Season 10 of TRAILER PARK BOYS on Netflix. Born in Iowa, Arnold has established a writing scholarship and runs an acting workshop for students at the Indian Hills Community College in Iowa. Arnold is heavily involved in many charities such as The Race to Erase MS, the Elizabeth Glaser Pediatric AIDS Foundation, Best Buddies, Camp del Corazon, The Kayne Eras Center, Promises Foundation, Carousel of Hope, Arnold's Inner City Games, The Hollenbeck Christmas Giveaway, the Leukemia and Lymphoma Society, Special Olympics, the USO and GLAAD for which he won the Vanguard Award. Tom Arnold recently returned to his roots as a stand-up comic. Never scripted, Tom pokes fun at his Midwest past, marital follies and absurd Hollywood stories. Just like his past film and television comedy work, Tom is a ball of chaos and charisma on stage. Arnold currently resides in Los Angeles.